A second volume, titled Bringing Cheyenne Home, tells the story of what happened afterward - starting with the family's first day back in court and goes on to detail the tumultuous years afterward, including a peek into Cheyenne's life today. Bringing Cheyenne Home will be available soon on Amazon for Kindle. Basic Steps To Correctly Train Your DOGGIES: A comprehensive guide to training your Dog. 3.0 out of 5 starsDid I Like This Book Enough to Buy the Rest of the Story? Find Out. There are many problems with the court systems especially when it comes to children and access to those children. This book does put the spotlight on an issue that needs to be discussed but probably is not, since it involves children (who do not vote) and because we have a poor backup system (foster care) and don't want to invest money in our kids. Rachel is a good writer when she is in storytelling mode. She starts off qualifying her book and her life mistakes which is not a great idea. Let the story stand. It is what it is. We all make mistakes. Don't blame everything on being young. It's also kind of off-putting that it seems her only salvation is another man, but that is the case oftentimes. The story should be true, so she leaned on him, and that needs to be part of the story. I did follow along when she was telling what happened. There were some time shifts that made keeping up a little difficult, but I think I pieced most of it together as I went. The writer was clearly invested, and her passion did shine through in many spots. The bottom line for me is that this book was offered free. Then, it just dropped off mid-action. I got a click to buy the "sequel" for close $5. I consider that dividing the book in half and charging for the outcome. I've gone back and forth. I liked the book to get invested in what happened to the family and especially Cheyanne (the daughter), but I don't think I'm going to buy the sequel on principle. If part of the book is free but I need to buy the conclusion, then tell me up front. You a really exceptional story before I'll spend money when that was not clear from the beginning. It's just the principle of it. This would be a horrific and terrifying experience for any caring mother, and Rachel Jensby coveys her feelings on the run with her small daughter so well. Good on her for being brave enough and having enough gumption to 'criminalise' herself to protect her small daughter. She is to be congratulated, too, for deciding to write this book in the hope that it will help other desperate mothers on the run. Jensby tells her story in a manner that faithfully demonstrates the ever-increasing stress that builds when on the run from the FBI and a child molester. What shocks Rachel is that her four year-old remembers the sexual acts done on her in infancy and knows why they are running. But at least this bright child has an exceptionally good relationship with Jensby's male partner and the constant hiding should cement in her little head that the 'bad man' is the culprit and she is not to blame. This should be compulsory reading for anyone in the judiciary system or anyone working in child protection. I found this true story to be profoundly moving, honest, and generous. The then very-young author showed profound self-reflection, maturity, parenting skill, and insight far beyond what her youth or early history would predict, which in itself is quite remarkable and inspiring. The very fact that this story had to be written is an indictment of a court system that imperils children's safety and wellbeing, and leaves conscientious parents in unconscionable dilemmas they and their children should never have to face. It exposes the great need for the courts and "child protection" agencies to have much more comprehensive training in the psychology of sociopathology and personality disorders. While the author gives credit to the caring people within uncaring systems, who do their best to protect children against rules that favour manipulative, disturbed, destructive parents, she also exposes the many flaws in these systems, and the devastating consequences for children and the parents who risk all to try and protect them. My heart went out to Rachel, her partner, and Cheyenne, and I was struck with admiration and respect for the love and loyalty they unfailingly shared, in almost unbearable circumstances. The book is also a testimonial to the many good people - friends, family, and strangers alike - who willingly went out of their way, often at considerable personal risk, to help protect a baby from unimaginable violation. And in addition to the compelling subject matter of the narrative, I felt the book was extremely well written. 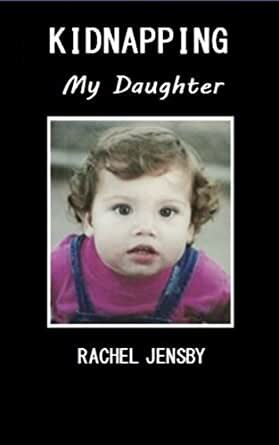 This candidly written debut: "Kidnapping My Daughter" details the complicated and disturbing situation of author Rachel Jensby faced to save and protect her toddler daughter from sexual violation/abuse by her former husband, and her daughters biological father Steve. Jensby married Steve at a very young age, though she had a loving family, plenty of friends and attended college, she missed several "red flags" that included controlling, manipulating, and stalking behaviors. Steve would later prove himself to have probable addictions to alcohol, substance, and various sexual problems. Concerned, his own father questioned Steve about the terrible way he treated his wife. After the couple separated and later divorced, Steve joined a religious cult. After finding serious symptoms and signs of her daughters sexual abuse after being in Steve's care, Jensby notified the authorities, her daughter was examined by a professional medical specialist, though Child Protective Services seemed unable to offer much assistance. This part of the story is unclear. With her second husband Ben, Jensby took her daughter and fled, went into hiding, lived underground in other states, while being tracked by the FBI. This predictably brought a whole new set of problems and stress. While Jensby is a good storyteller, appears to be a loving devoted wife and mother, there seems to be more to this dramatic storyline. It turns out there is, and the reader must continue reading a second book, "Bringing Cheyenne Home" which draws this story to a conclusion. Many thanks to the author for the e-ARC for the purpose of review. ~3* GOOD.